1. Stock rally fizzles: U.S. stocks are near all-time highs but the recent rally seems to have fizzled out, in part because of President Trump's growing isolation. 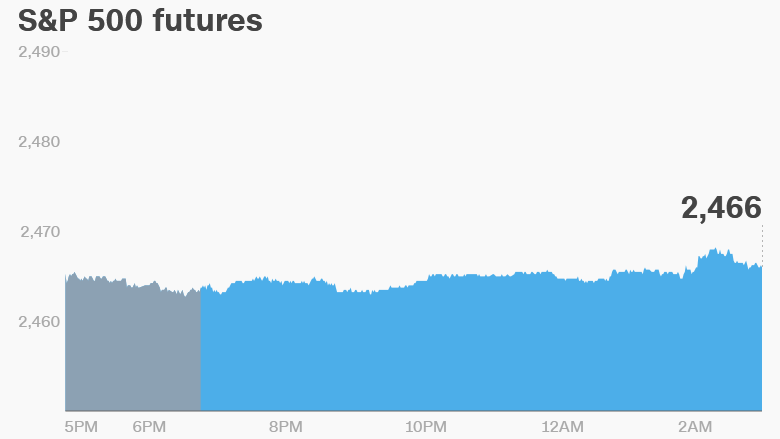 U.S. stock futures were flat ahead of the open. The Dow Jones industrial average, S&P 500 and Nasdaq all trimmed their gains Wednesday as top executives abandoned Trump's business advisory panels in protest over his response to the violence in Charlottesville. Top Republicans have also been critical of his insistence that violence at a rally of white supremacists was perpetrated by many sides. "While this does not necessarily mean fiscal reforms are dead, it may slow down progress, which is bad news for both stocks and the dollar," said Hussein Sayed, chief market strategist at FXTM. European markets were all slipping in early trading. Asian markets ended with mixed results. 2. Retailers in focus: Walmart (WMT) is reporting earnings ahead of the open on Thursday. Wall Street is hoping to see the retailer making progress in its fight with competitor Amazon (AMZN). Walmart CEO Doug McMillon may also face political questions during his call with analysts. On Monday, he took Trump to task for his response to the events in Charlottesville. Alibaba (BABA) is also releasing earnings before the open, while Gap (GPS) and Ross Stores (ROST) will report results after the close. 3. Market movers -- L Brands and Cisco: Shares in Victoria's Secret parent company L Brands (LB) are set to tumble as investors react to the latest quarterly earnings. Cisco Systems (CSCO) shares are also looking weak in premarket trading.